From the left: Ruth Wagner, 3, glues a bunny mitten as her mother, Jessica Wagner and sister, Stella Wagner, 1, look on during the Wildcat Glades' "Bunny Hop" on Wednesday at the Wildcat Glades Conservation and Audubon Center. 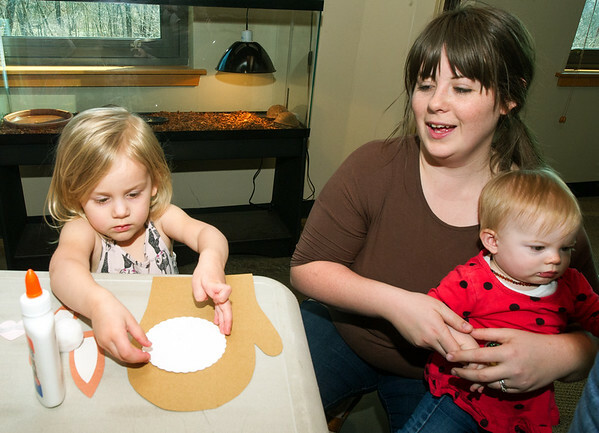 Preschoolers learned facts about bunnies, created arts and crafts and went on a brief bunny sighting hike. The free program was made possible through funding from Pediatric Associates of Southwest Missouri.